Of late, BTCUSD (at Coinbase), sideways trend goes in a narrow range, the current price trading at $3,575 levels, remains well below 7 & 21-DMAs. 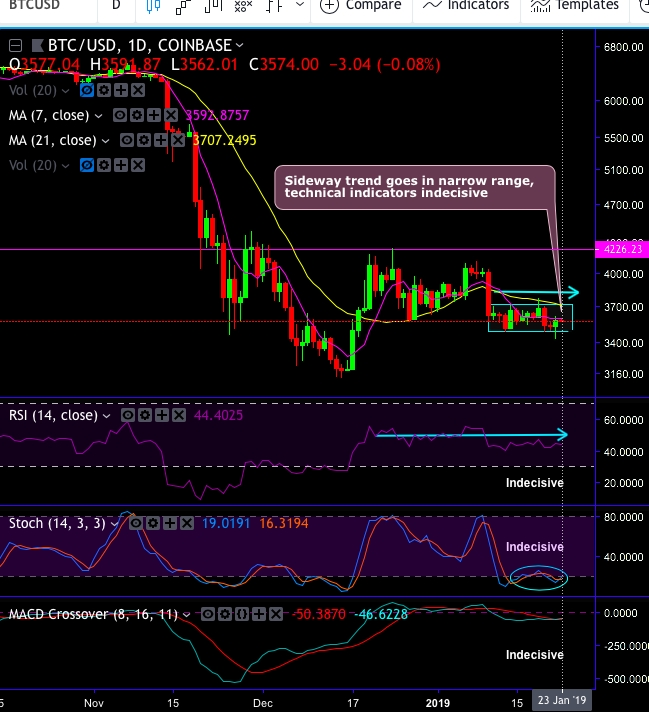 As you could see the daily plotting of the pair, all technical indicators have been indecisive. This would be the final chance for relevant futures contracts to be traded or squared off and post this date outstanding contracts need to be settled by cash as per original specifications. The days surrounding futures expiration are always prone to unusual volatility or price activity with scenarios like short squeezing, tending to exaggerate price movements, you could evidently see that in underlying spot moves. The trading in CME, and CBOE bitcoin futures that have been unveiled by CFE under the ticker symbol "XBT" (contract specifications fact sheet) facilitates numerous benefits to the participants, such as, efficient price discovery, deep liquidity. transparency, and centralized clearing. XBTfutures provides a centralized marketplace for participants to trade based on their view of bitcoin prices, gain exposure to bitcoin prices or hedge their existing bitcoin positions. Currency Strength Index: FxWirePro's hourly BTC is flashing at -134 (bearish), hourly USD spot index is creeping up at 22 (which is mildly bullish) while articulating at (05:17 GMT).